only available in the official version of rpgmaker2003. hedge1 for his program sprite sheet creator, which this game would not be possible without. Blind, probably one of the best dudes to talk while creating rpgmaker games, check his game Beloved Rapture. Kaempfer, probably one of the most reputable rpgmaker testers, very solid and very thorough advice, he won't let you down. Be sure to check out his rpgmaker2003 game Evoker. Project Heaven's Door by JosephSeraph. And that really cool game that Darken is working on that he hasn't made a gamepage yet for. EDIT:(NEW) When you get the chance, check out the Demon Legacy Remake, Eldritch Law, probably one of the most promising rpgmaker demos of this year. It's going to be really crazy to see what type of rpgmaker2003 games this new feature will bring! Thank You for checking out the gamepage! Battle Message Window, learned and studied from Leric's rpgmaker2003 game CyberFactor. Special Thanks to Qhimm (the ff7 forum site) for additional help. This game is dedicated to Atendra Diwakar (Aten) who passed away on November 11th 2013 - Aten was a large contributor to RM tutorials back when it was still an active website - What was particular important about Aten's work, was his approach to creating custom battle systems: not only did he recreate these particular final fantasy battle systems in rpgmaker2003, but unlike other rpgmaker fan games, they actually looked like, the techs they were based off of: "Steal" actually looked liked "Steal", "Scan" actually looked like "Scan" and "Summon" looked like "Summon". 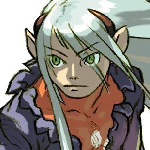 Aten's work was always created in such a way, that it was very easy to use, and very easy understand so much that, his work is still being used today.Be sure to check out his games, Legend of Vanadia and Final Fantasy Dreams. These games may not have won any awards, but they are sort of a testament to the creative prowess he was capable of. 2018's Punniest Game Alive Winner, shares history with Newgrounds flash movies and rpgmaker. As I mentioned in this thread. I got my start playing stuff like MegaMan RPG and AOL vs. Final Fantasy on Newgrounds back in 2001. These games look kind of dumb now right? Well, to be honest, they always looked dumb. But back in 2000, with the success of the Final Fantasy series here in the west, for the longest time Macromedia Flash was the only thing a lot of us had access to when creating our own Final Fantasy games. With that said however, I thought AOL vs Final Fantasy, was the coolest thing ever!! Since I didn't have FF9, I played this game like, a thousand times studying how this guy got this thing to work, cause at first glance it looked like this dude got so close to creating a living breathing Final Fantasy game in Flash!! It starts off with Cloud and Vincent - in aim chat gif format - facing off against one of those AIM Buddy Icons, before Vincent disconnects in the first round! ...Anyways the game ends with Cloud performing an "OmniSlash" on the Aim Chat Buddy Icon, before a little Chocobo lands on his head asking the user to replay the movie - Yes, you heard that right folks, this little tech demo, wasn't actually a game but an interactive flash movie. But that was the reality back in 2000! We knew how to make these games look like Final Fantasy, we just didn't know how to program them - But a lot of people came close. FFAA was a really cool parody web/game series created by the denizens of the 2ch community. What was remarkable about this series, was how they finally got a fully functioning Final Fantasy battle system to work in Flash. - However, what was unique about this format, was the platform it was created for: web distribution. Because file size was still such a huge point of contention, back in 2000s, these guys had to figure out, how to create the shortest amount of "Final Fantasy" in the least amount of time. So each episode consisted of: an animated cutscene / followed by a final fantasy battle / and then ending with another cutscene. As a result, they created a new format, one that was short enough for episodic content and online platform distribution, but unique and compelling enough that it still reached the same emotional heights you'd find in traditional jrpgs - With FFAA, I thought, for sure this format was going to be one of the many futures of indie rpgs going forward. ...So once I came to GamingW in 2007, I was immediately taken aback, not only by, just how far behind we all were, but over what I saw: a community that was still at odds with itself, fighting over the future of rpgmaker games, before rpgmaker could even truly begin. During 2000, in Flash and sites surrounding Newgrounds we had guys like Nelson Hurst on FlashKit.com, the creator of Genryu's blade, he made a short flash animated movie, that was so good and seen all over the world on the internet, that it premiered on TV in the states on ShowTime. Adobe contacted him immediately and asked if they could license the .fla file for research and development to help make flash more animator friendly. This changed the way, not only how future animators approached flash, but changed the accessibility of digital animation and animation overall, forever - When you go to animation festivals now, and ask new students what inspires them, it's not disney or pixar, it's a cartoon they've seen on Newgrounds or an animated short they saw youtube by one guy that made it big that inspires them. ...But with rpgmaker, it's an entirely different story - I've been here since 2007 and I've seen a lot of things, but there's one thing I can say with absolute certainty: Our community is so incredibly small, that whatever feud you may have against some rpgmaker game developer, or how their game somehow got popular on youtube, tumblr, reddit or some other social media distribution site, is not worth fighting over - rpgmaker still has something to prove. With rpgmaker 2000 and 2003, finally available in English, legally, we now have a tool that can make games like Final Fantasy and more for commercial distribution. I've waited years, for a program like this, but it feels like not only are we still fighting with each other at times, but we're constantly playing catch up with the rest of the world - Please don't squander this opportunity. If you need to, become a better writer, learn how to draw, take an art course, take up programming, start a band (Yes, there's actually a great set of soft skills and leadership skills in there too!) 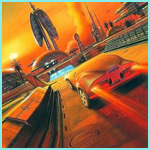 - do anything and everything you can get your hands on, so your game can stand out, just a little bit more while approaching these programs, because it all matters when you're making these games. RPGMAKER won't make your game for you, there are shortcuts, but you still need to know these fundamental, principle things - It all matters! But most importantly, we can't afford to fight with each other. We have so many hours and so many years ahead of us, to make these great games with. We can't afford to waste them. Now is the best time to be an rpgmaker! Nice work getting this running bb. I’m still surprised how many 2k3 users haven’t hit the ground running with Cherry’s updates. I see a doge, I sub! Ha, this is looking to be really interesting though, it's got my interest piqued! It's only January but The Misaos 2018 winner is already confirmed. The gameover is amazing and the ending is so worth it. Did any game actually use the "Movie" resource? Only thing I can think of is Nigsek and one of those RM Sample games. But yeah, there were a couple of rpgmaker games that used the movie resource, I actually had to study them in order to learn how to make those movies that appear in the demo. If you guys know of any other rpgmaker2000/2003 games that use video files - hold onto that thought, this tech demo's purpose was kind of my subtle way of announcing we might have video playback returning to rpgmaker2000/2003. If you guys were ever interested in creating FMV at a reasonable file size for rpgmaker2000/2003. Stay tuned, I have a video thread in the works that will answer a couple of these questions on how you'll be able to do this yourself. But ya, this was one of the benefits that came out of studying old rpgmaker games from the archive, you learn new tricks from studying old games. This made me laugh quite a bit. Bravo, LBR! For anyone wondering how I got the dog to dance in rpgmaker2003, here’s the step-by-step tutorial on how to do it, feel free to ask any questions in the comments section – I really want to make this as clear as possible, so everyone can start using this feature. Also, incase anyone missed it, here’s the video thread/tutorial on how to add video to rpgmaker2000/2003. I spent a long time putting this together – At first I wanted to make it a tutorial but decided to turn it into a thread instead, so that like the archive thread, I want to add/edit as I go along – having it in sections makes it easier to keep track of and edit futher – please take a look at it, try it out, you can put any video in rpgmaker2003 now, you can even put youtube videos in rpgmaker2003. There are some limitations to this feature, but I think that with youtube and the internet, I think video editing has gotten to a point where, the play movie command in rpgmaker2003 is worth another look. 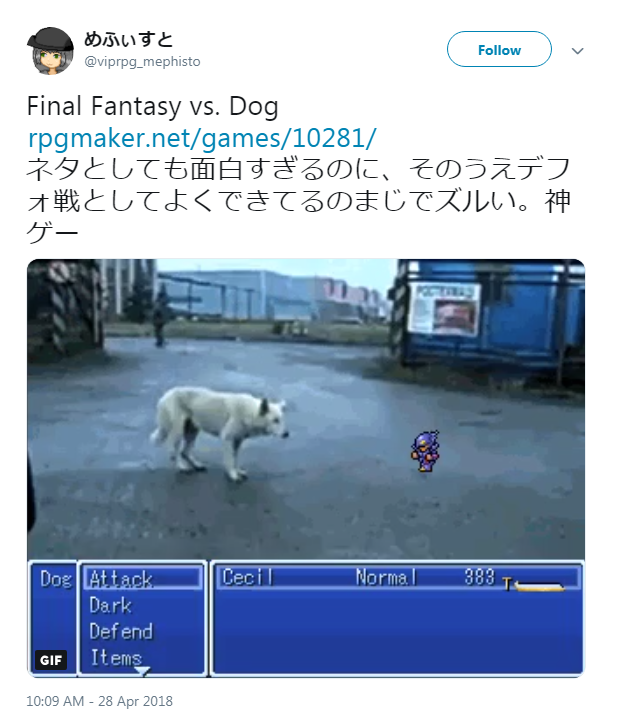 EDIT: Also misao nominations are now open, so if you want to, please nominate Final Fantasy vs. Dog, if you get the chance. I have a bunch of other, one off tech demos planned, like this one, so depending on how this goes, I might even add more to this one, just as a thank you for the warm reception this has been getting. Honestly, with so many great games coming out within the first 2 months of 2018, I'm just thankful this is getting nominated at all! Your words mean the world man, thank you! How did I not know about this!? This has everything I like, and is the weirdest thing since Kanye Quest 3030.